The Hot Chocolate 5K is run each year in early December in Northampton, MA. It is a very popular local race that supports the Safe Passage nonprofit organization assisting those affected by domestic violence. It’s a tremendously giving organization that provides a valuable community service. I first ran this race in 2010 with Orlando. It’s a large race with a few thousand runners. At the end, instead of a medal, you receive a commemorative mug and complimentary hot cocoa. After the Montreal Marathon, Carlos melted my heart by asking me if we could run a race for his birthday. 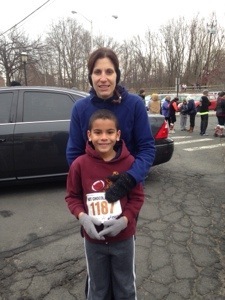 I knew the Hot Chocolate 5K would be the perfect race since it falls just before his birthday. Carlos and I began “training” in November. He was very enthusiastic about it. I let him guide the training runs so he wouldn’t feel pressured or bored. We still go out for short runs together. It makes me smile when he asks if we can do a mile. At the beginning of fall I also began walking once a week with a friend. She said she was interested in running a 5K and was hoping to prepare for the Hot Chocolate 5K. However, she hadn’t run in a long time and also struggles with severe knee pain. We would typically walk at least a 5K distance, but the pain made running impossible. Since Mary didn’t seem to have discomfort with the walking I suggested speeding up the walk for short intervals. Unfortunately most of our walks turned into mini brain dumps and chat sessions for Mary. As the 5K neared my friend expressed her concerns that she didn’t think she would be able to run the race. I assured her that we could walk it. On race day Mary was combatting an upper respiratory infection. I suggested that her daughter and Carlos run with Orlando and I would stay with her. The race began and we started in the back. I encouraged her to jog through the starting chute to try to harness the excitement and gain momentum. She did and then quickly slowed to a walk exclaiming that it was uncomfortable. I told her I would take my cues from her, when she wanted to run we would run and when she wanted to walk we would walk. She kept telling me to go forward, but I assured her I was staying by her side. I could tell her mood was sinking. She grew frustrated and embarrassed as more runners and walkers passed us. Before long we were dead last. My pep talks were unhelpful. Every time we set off to run Mary struggled with breathing and knee pain. I told her to just walk and chat like we were on one of our weekly walks but she was so discouraged. I felt terrible for her. There was only one other participant in sight and we finally caught up to her. We didn’t see another runner anywhere and suddenly we crested a hill and saw the race perpendicular in front of us! Uh oh we had gotten off the course and now were faced with a dilemma. Mary was on the verge of giving up. The girl who was now walking with us shrugged her shoulders and said “ah what the heck, let’s just jump in.” We followed her and merged into the mass of racers heading down the final hill toward the finish line. My heart sank in my chest. I tried to be a good sport. I told Mary it would be our secret. However, it killed me to “cheat” (Catholic guilt!). I knew Mary just wanted to be done with the race, and she was really worried about her daughter seeing her come in last or close to it. Carlos, Orlando and Mary’s daughter were there when we crossed the finish line. They were none the wiser. I was so proud of Mary for making it as far as she did, but I know her spirit was crushed. Carlos was so excited when he saw me. He told me he ran the entire race. He was beaming from ear to ear. I was sad I didn’t see him cross the finish line, but I was so proud of him. Turns out Carlos ran his first official 5K in 32:16! I hope Mary is one day able to run another 5K. I think it is important for her to return to that goal and see it through to a triumphant finish. I have told her that I’m here if she wants to try training again. I would be honored to cross that finish line with her. Very tough position to be in. Having been both the encourager and the “crashing and burning while being encouraged”-er, it’s tough for everyone. Glad you got her through the race and hopefully she’ll be encouraged to stick with it. The first one’s always the toughest! First of all, congratulations to Carlos! His first 5K when he is so young and the fact that he was so excited about it can only mean that he’ll probably want to do it again! It seems like you were in a very tough situation…it’s very hard to be encouraging when someone is so down…like Carina said, I think I’ve been in both positions so I know. But she did get out there and at least TRY and for that I’m sure she has you to thank. I did a 5k one time with a co-worker, and she didn’t prepare as much as she should have. It was a small local race – probably only 100 runners, and within 2 minutes we were already dead last. 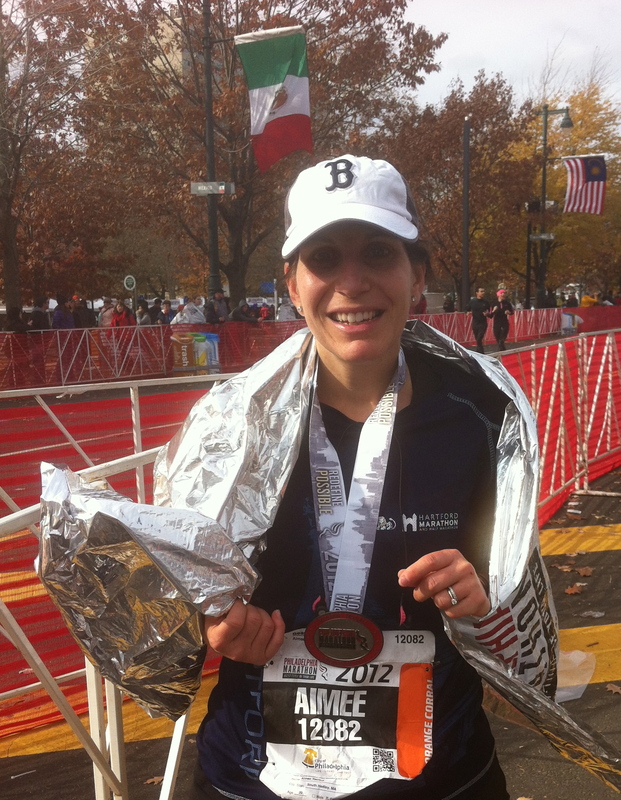 She started breathing heavy within a few minutes and I assured her I would stick with her to the end – we ended up crossing the finish line in 52 minutes, but she was so happy she finished it! I hope your friend gives it another go – and Carlos’s time is amazeballs! !